Sheriff's Office Seeking Public Input in Theft Case, GOODRICH, February 6, 2014 - On January 29, 2014 the Polk County Sheriff’s Office Criminal Investigation Division initiated a criminal investigation into a felony theft which occurred near Goodrich, Texas. During the commission of the crime the suspect took several thousand dollars worth of items from a residence over a lengthy period of time. Detectives began investigating the case directly after the report was taken and were able to locate several of the items taken at local pawn shops. 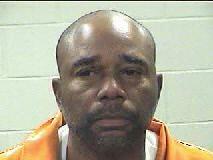 A suspect, Darryl Ray Woods, 50, of Goodrich was developed and determined to be the one who pawned the property. A warrant for the arrest was completed and presented before Justice of the Peace Darrell Longino who issued the warrant. On February 6, 2014 Woods was arrested at his residence in Goodrich and taken to the Polk County Jail where his bond was set at $50,000.00. Detectives ask if you have been contacted by Darryl Woods who may have tried to sale anything of value or bought anything from Darryl to contact Detective Christopher Lima @ 936-329-9027.